Cranes from China still are rare on western European construction sites. Sany, Zoomlion or XCMG are just starting in Europe. Service organizations need to be built up as well as taking care of European design rules and laws. Also die-cast models of Chinese cranes are rare in Europe. 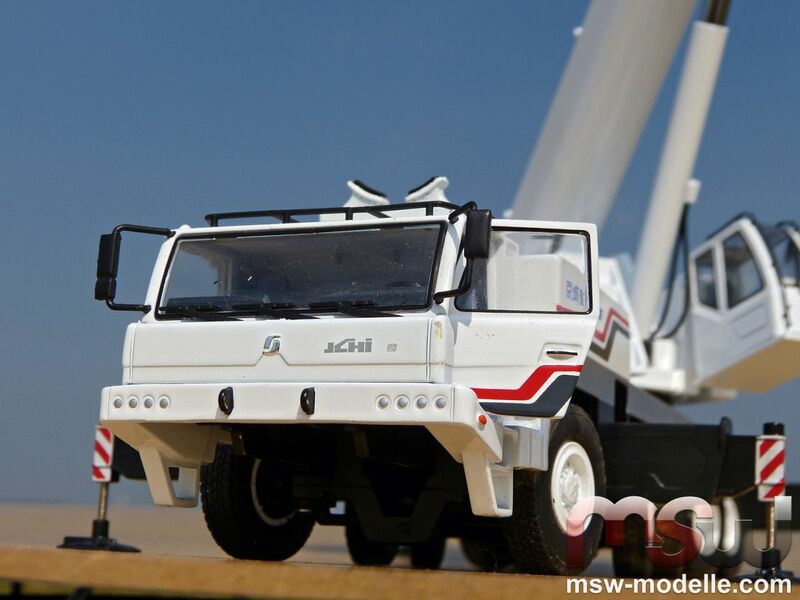 Zoomlion for example didn't sell any models for collectors at Bauma 2013. 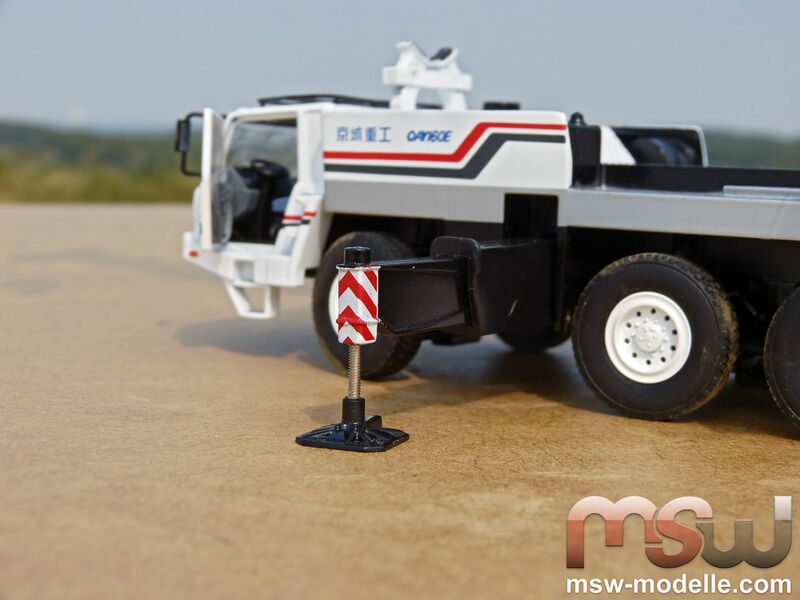 Thanks to MSW Modelle now two new Chinese crane models are exclusively available within the huge MSW shop providing an exciting insight into the Chinese crane world. 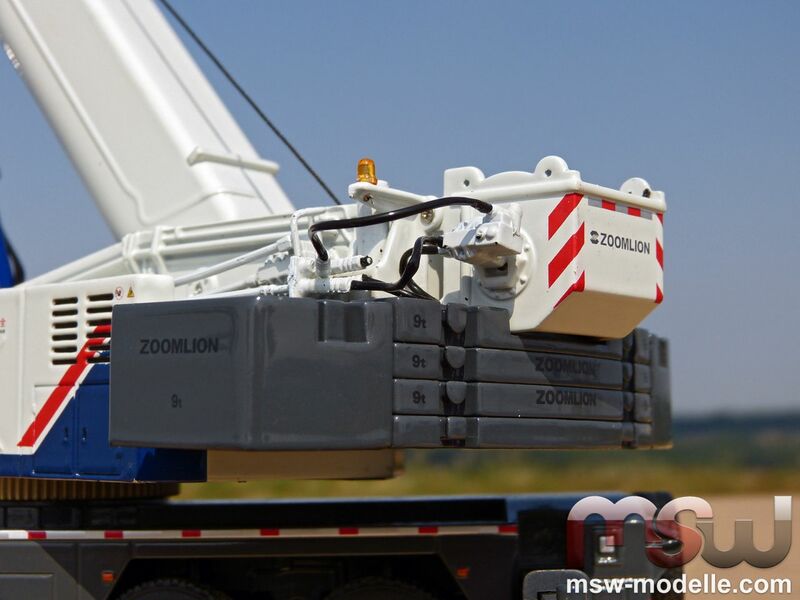 One of the better-known brands is for sure Zoomlion; out of their crane range the 220 t crane QAY220 is now available. 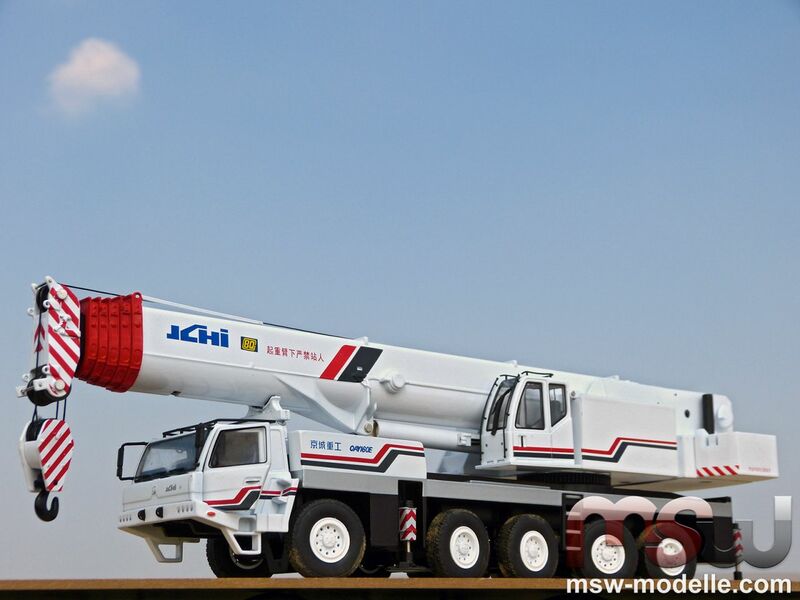 Bejing Jingcheng Heavy Industries (JCHI), whose QAY 160E is available from MSW Modelle, therefore belongs to the less known crane manufacturers. Both models are definitely worth a more detailed and closer look, since they interestingly use some components on both models at the first glance. 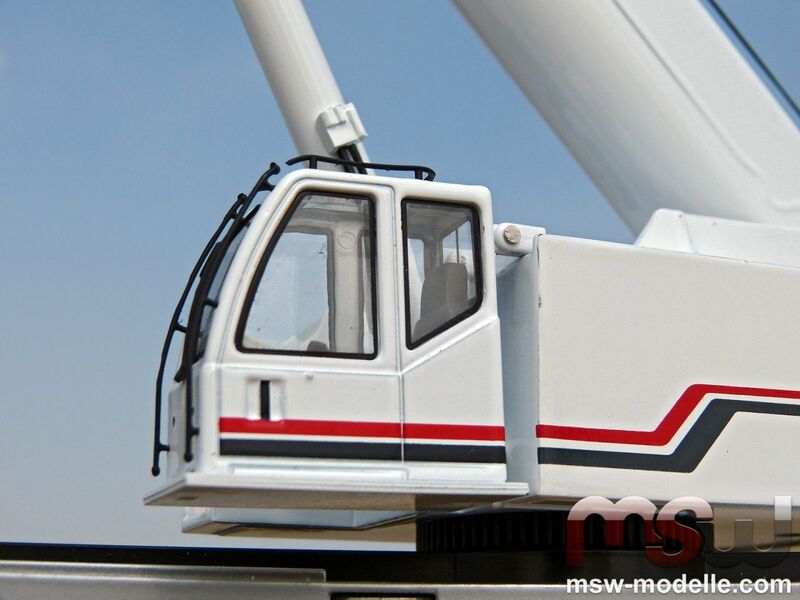 Boom, superstructure cab or main hook are the same on both crane models. Although the level of details varies between both, it is still on a high level. 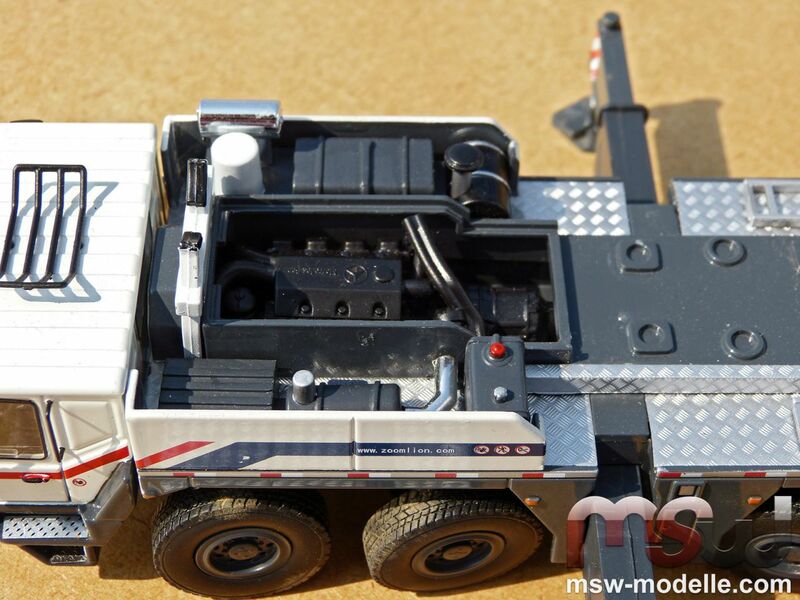 Surprisingly no model manufacturer is mentioned on the robust model boxes. 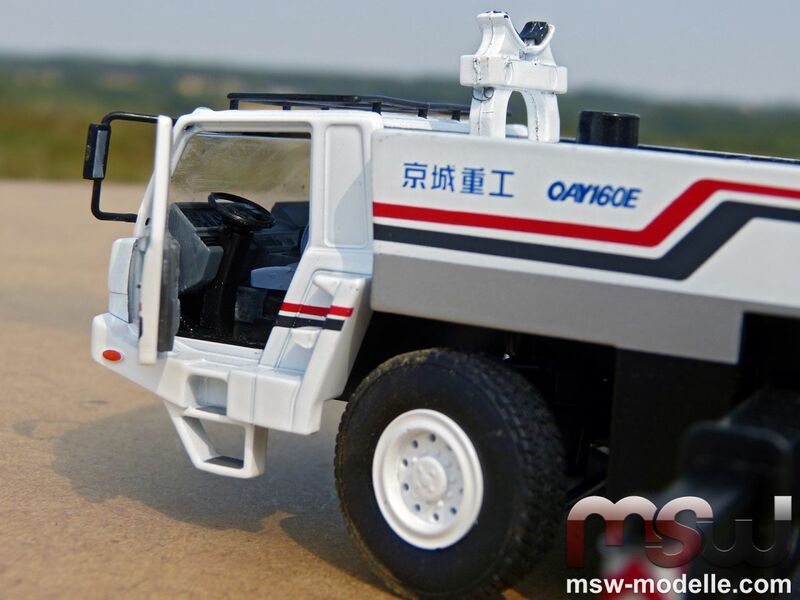 But both QAY 220 and QAY160E are mentioned on the website of the Chinese company Dongguan Shangjia Model Product Co, located in the city of Shipai, Southern China. This relatively new company has 500 employees according to their website and was founded in 2000. 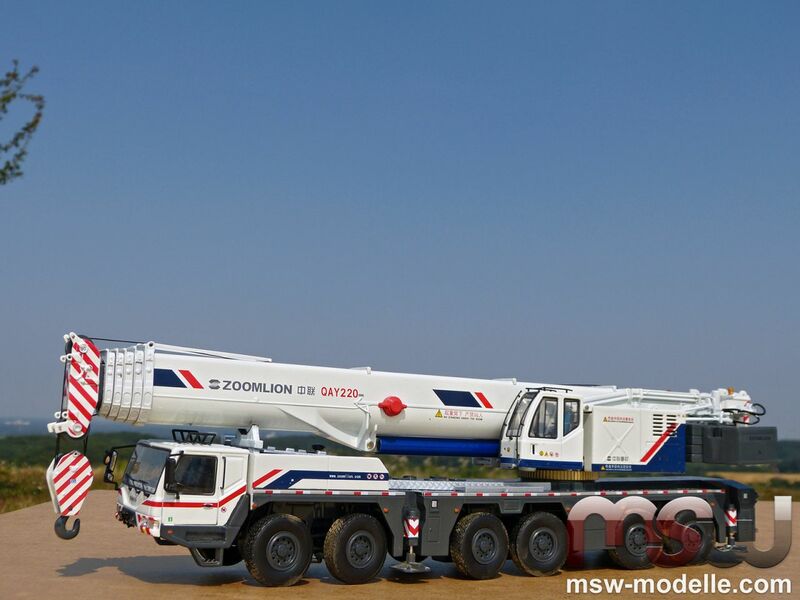 An impressive model: Zoomlion's 6-axle 220 t AT crane QAY220. 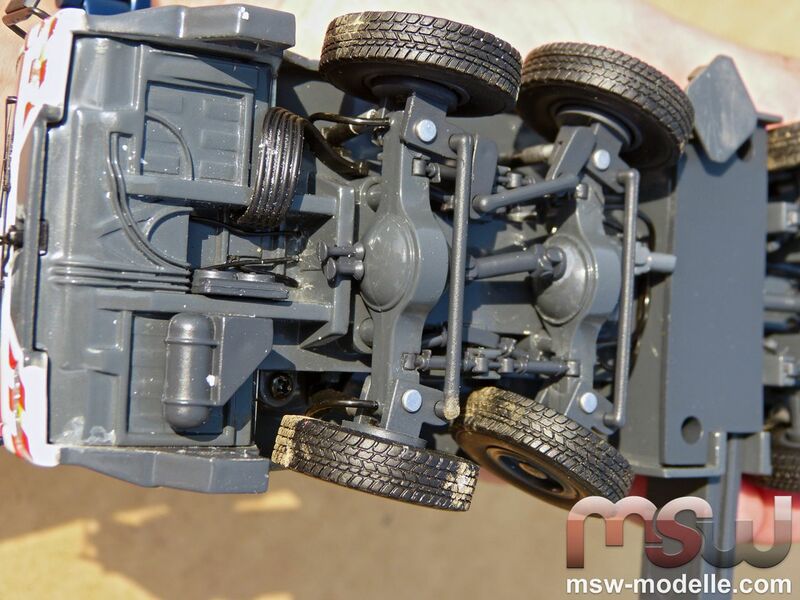 All axles can be steered and move easily. The drive train is perfectly copied with major details as hoses or crank shaft. 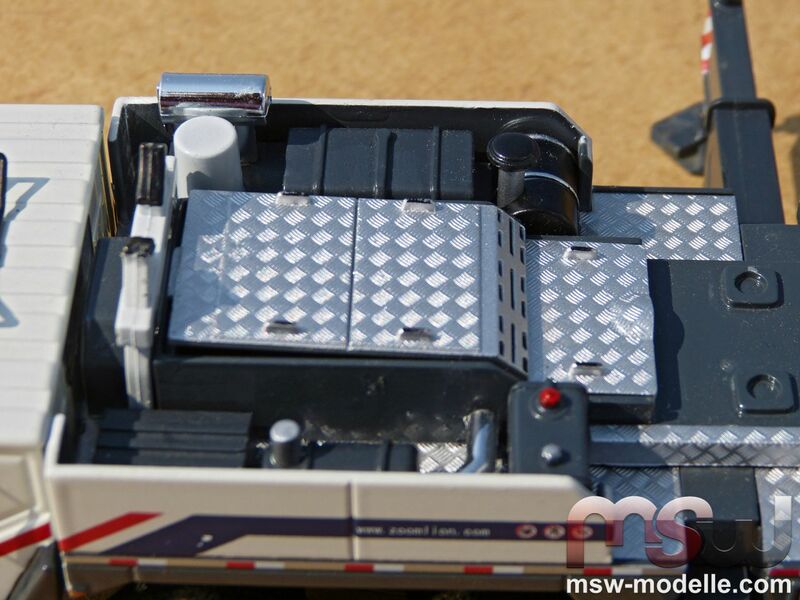 A highly detailed copy of the 420 kW Mercedes undercarriage engine is located right behind the cab. The distinctive Mercedes star can be seen on the first sight. It is also great that the engine is covered by a small plate, which can be removed easily. The four outriggers provide great stability for the QAY220 model. But the screw thread is not hidden and therefore visible. At work: Zoomlion QAY220. 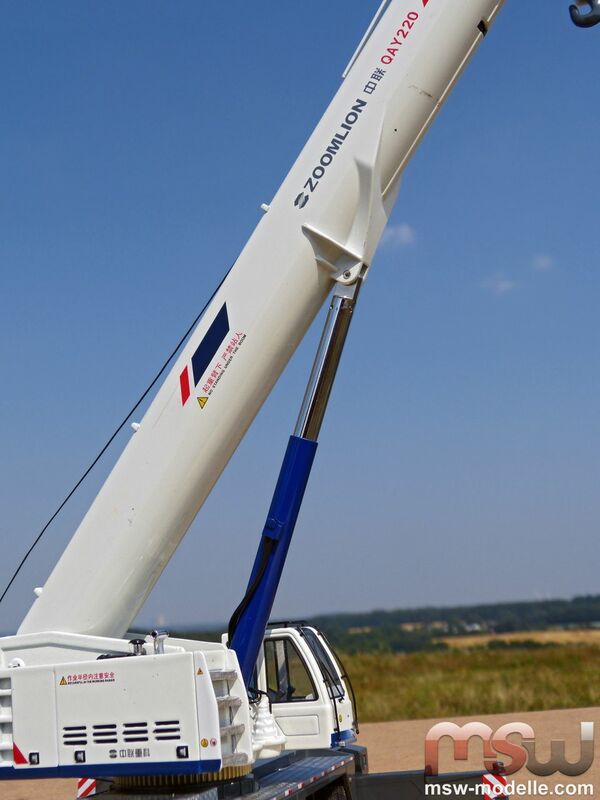 The boom features 5 sections which can be extended to a total length of 1,2 m.
The stiff boom cylinder is completely made of metal and holds the boom in every position. Small hoses are included and are routed also to both slew gears. 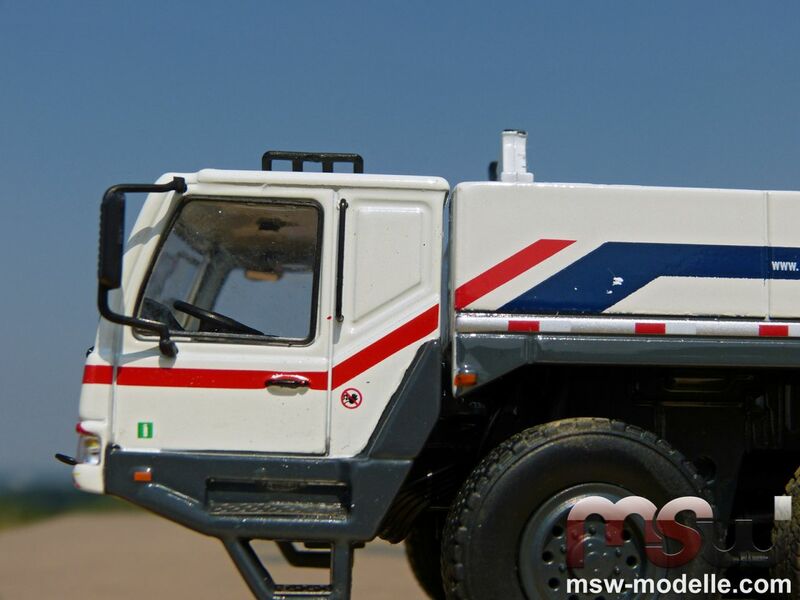 The superstructure comes equipped with detailed hoses and pipes, running to the indicated hoist motors. The counterweight is made of separate elements, which are unfortunately fixed to the model and cannot be disassembled. Each counterweight part features the printed Zoomlion sign together with the weight - in reality 9t. Two additional 9 t blocks are located on both counterweight sides. A small photo etched plate covers the superstructure engine cooler. Steps in front of it would provide access to the superstructure. 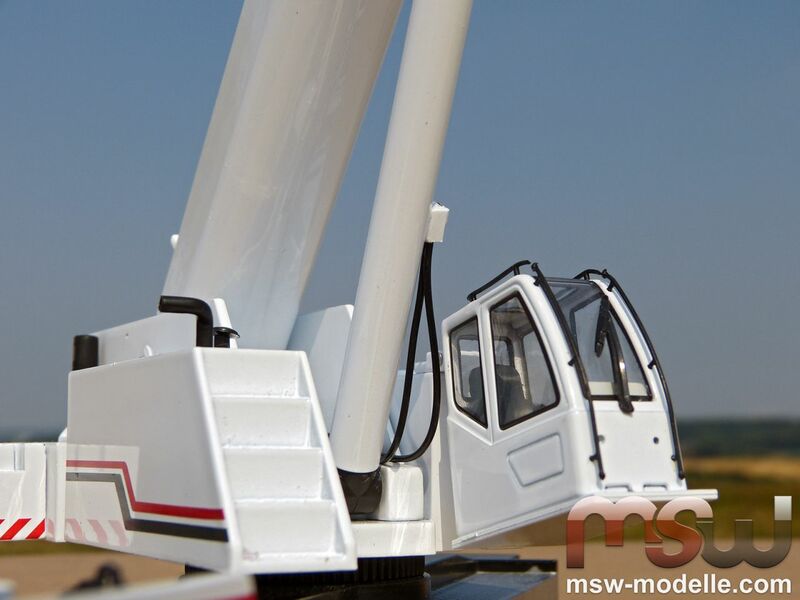 The superstructure cab can be tilted; a small hydraulic cylinder is hidden underneath the cab. Windscreen wipers, railings and a detailed labeling exist as well. 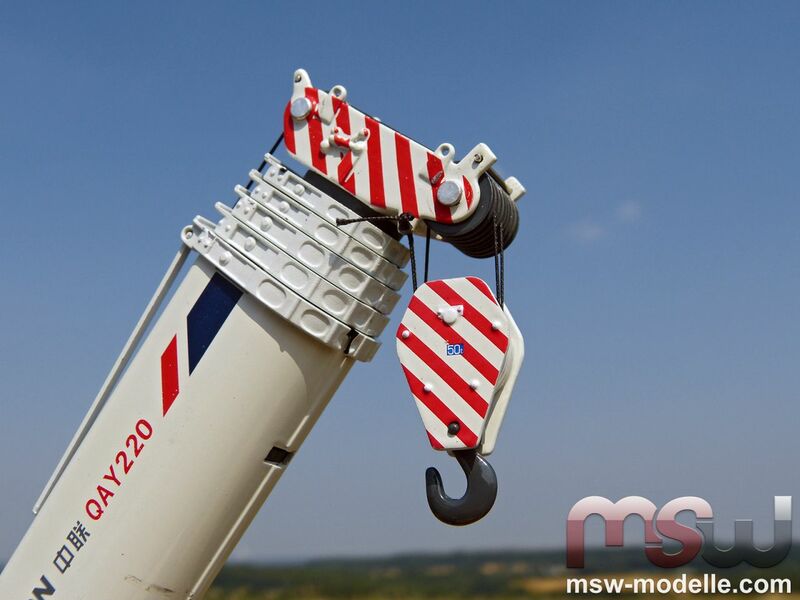 The maximum lifting capacity is 220 t; the QAY220 model comes with a 2-sheave hook for a maximum lifting capacity of 50 t. Unfortunately the line is twisting. 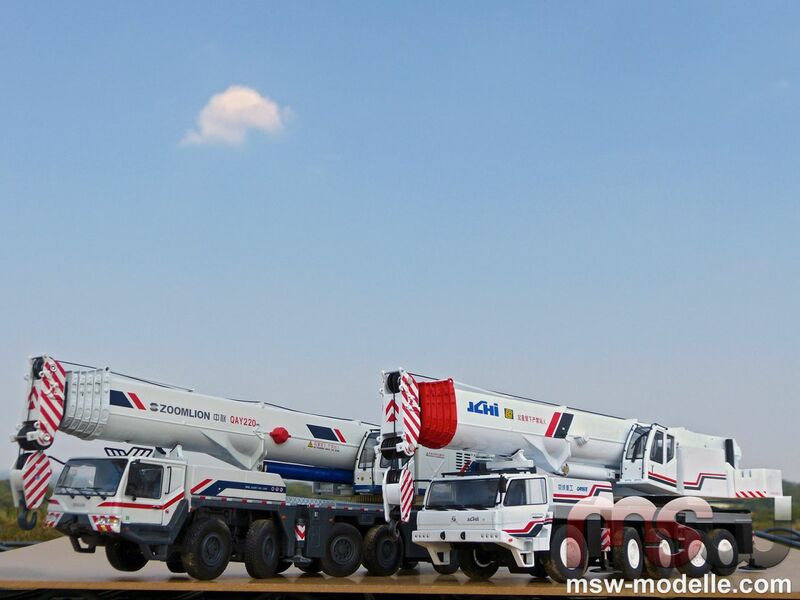 For the pictures both models were already provided with twist-free line. 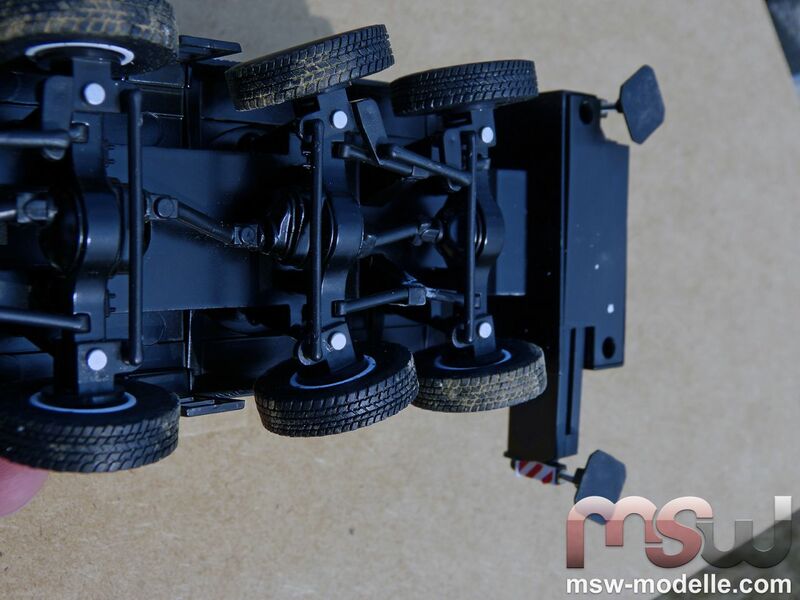 Of course MSW Modelle offers the perfect line for exchange purposes. 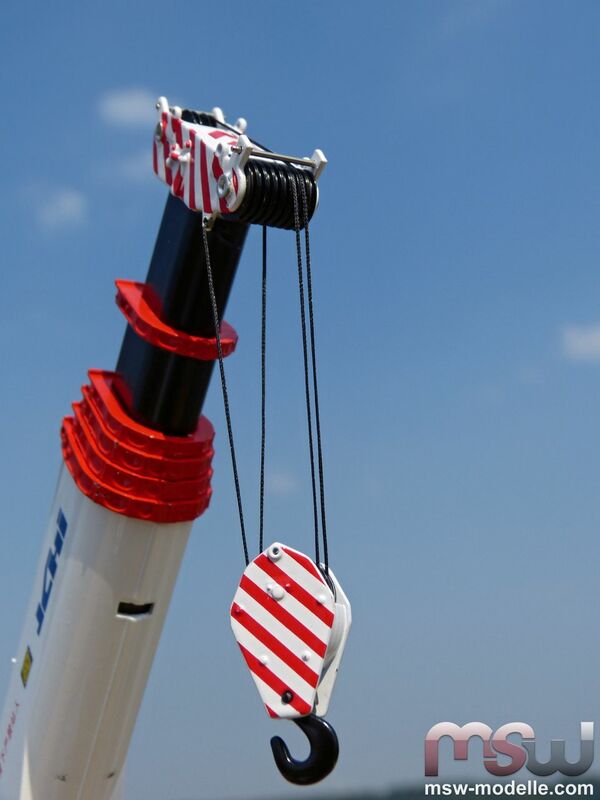 The Zoomlion brand is also printed on the lower boom including the crane type and warning signs in English and Chinese language. The undercarriage cab shows a detailed interior. 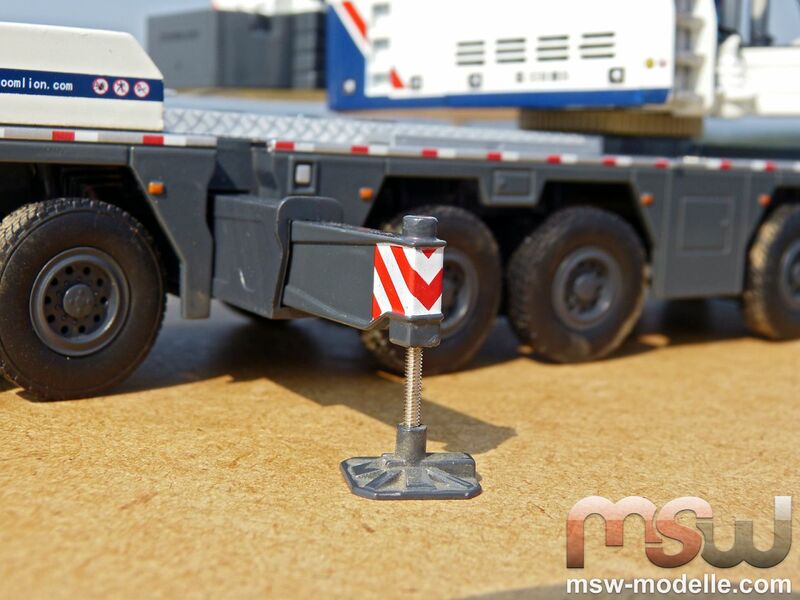 Mirrors, windscreen wipers, railings and even small warning signs complete the level of details here. 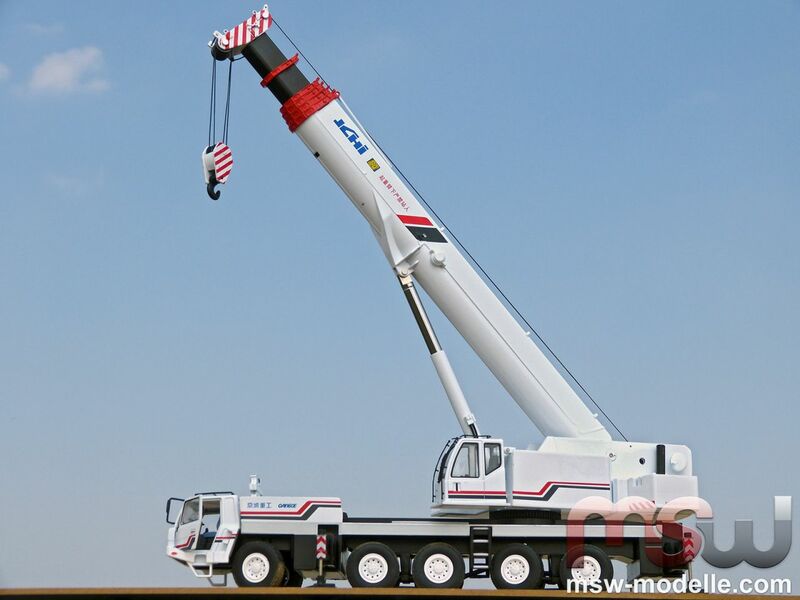 The QAY160E, too, can easily move on any surface, but this 160 t crane has a 5-axle chassis. All axles feature a sufficient steering angle. On the QAY160E the drive train is copied with much less details compared to the QAY220. Drive train with its crankshaft is copied in a simple way. Also the outriggers on the JCHI QAY160E are stable and do not have hidden screw thread. 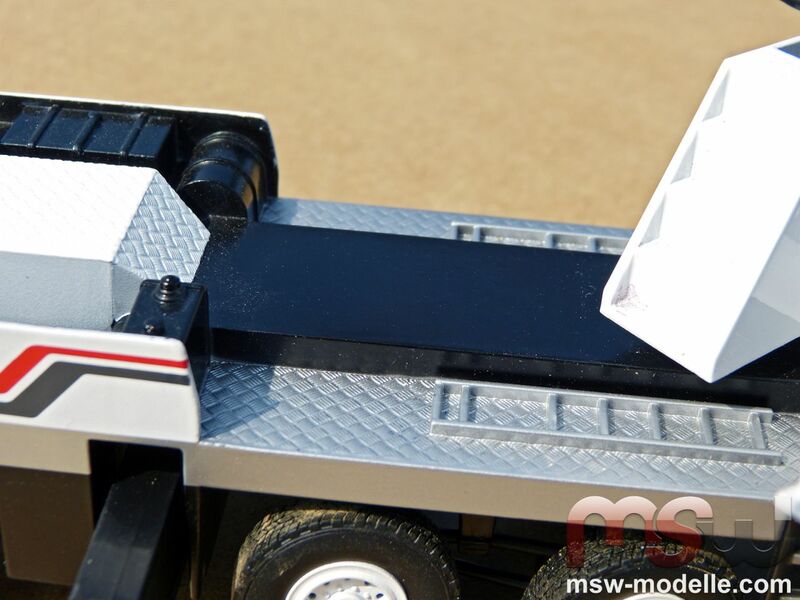 The superstructure cab doors can be opened providing a more detailed view to the interior. This is really a nice feature. Windscreen wipers and attachable mirrors can be found of course also on the QAY160E. 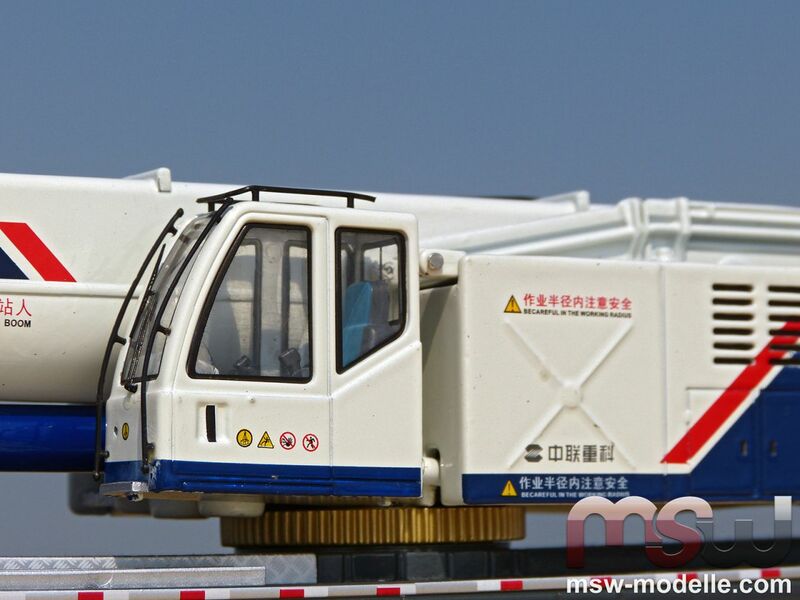 Similarities to a cab design of a German crane manufacturer are ignored here. An anti-slip surface with small ladders is indicated well on the crane chassis. In reality a 405 kW Mercedes engine would provide enough power. The massive superstructure is relatively simple without major details. Hydraulic motors or hoses on both hoist winches do not exist. But nevertheless, small hoses can be found on the boom cylinder, which provides a more authentic look. The superstructure cab is the same as on the Zoomlion QAY220 but with details as railings or door handle. 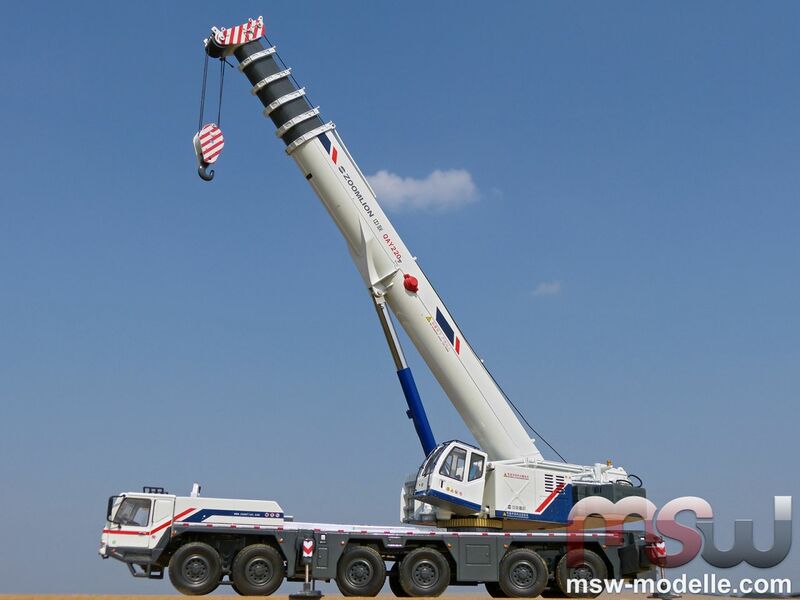 The 160 t AT crane QAY160E at work. 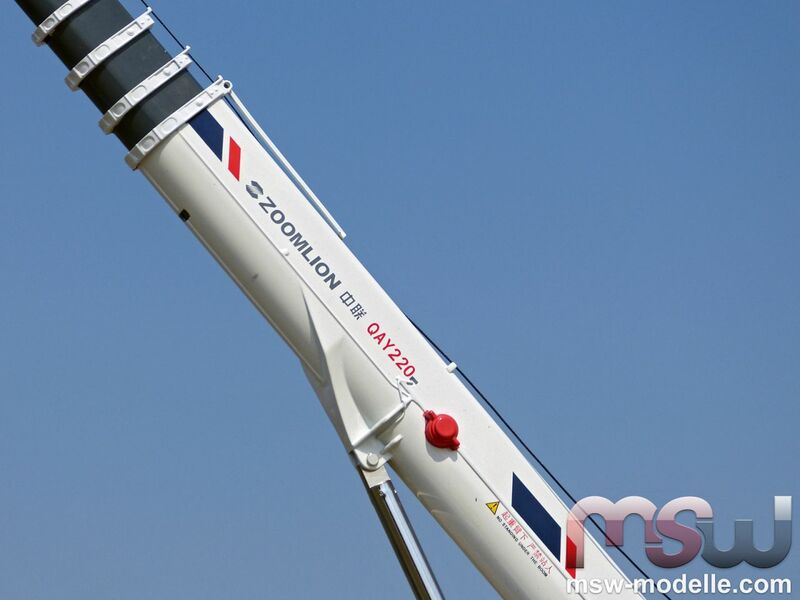 Interestingly the complete boom is the same as on the QAY220 from Zoomlion. The complete counterweight is made of one casting and cannot be disassembled. Only the two elements can also be dismantled. All metal sheaves are single type ones and move easily. Also the QAY160E was converted to twist free line. The hook is the same as on the QAY220 and can be displayed also with a 3 line reeving. Strong power from Far East: Zoomlion QAY220 and JCHI QAY160E during travelling. 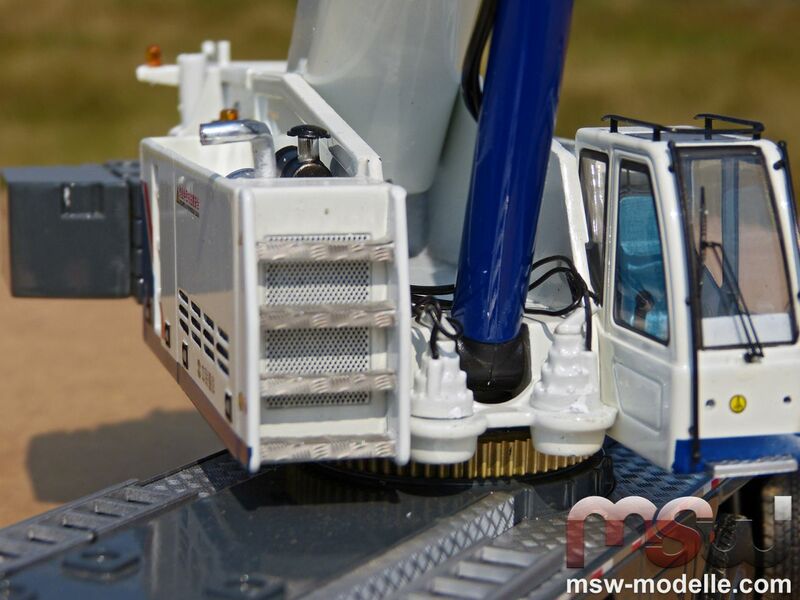 Highly but differently detailed and with a great functionality both cranes now can provide an impression of Chinese cranes into European crane model collations - thanks to MSW Modelle.